Over 25 years' experience of specialised work at the highest strategic levels as Chairwoman, Senior Advisor and Director in governments, state agencies, private companies and NGO. Today, she is the Founder of Good Government Affairs with former Ministers, Deputy Minister and Director Generals assisting PM and Presidents in the world to create strong and sustainable growth. The organization also handles bilateral relations and investments between different countries/governments. Owners and boards at Good Government Affairs: former Deputy Minister Roger Mörtvik, Lena Bäcker and former Minister Mats Hellström. 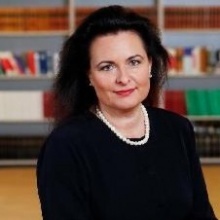 Ms Bäcker is also appointed as Committee Member at UNEDUCH/United Nation, Honorary Board Member of the top-level International Diplomatic Business Club's in both UK and UAE with Royals, Diplomats and Business Leaders and Board Member at Pan-European Union with former Imperial Princess Walburga Habsburg Douglas as Chairwoman. Previous job positions include Enforcement Director at charge for rule of law, supervision of the large Saab bankrupty, the Swedish financial rescue package "Taskforce for Greece" by the international Troika (IMF/European Commission/ECB), Chairwoman for the think tank for governments EAPB' Chief Economists Network in Brussels, Senior Advisor at Middle East W4SG, high-level government cooperation with Turkey, Georgia. Lena has an extremely good top-level network of PM, Presidents, governments, ambassadors, large international organisations and the corporate sector in the world. Government Affairs, Good Governance, diplomacy, human rights, international relation, foreign/public policy, Public Affairs, Emerging Markets, politics, management, strategy, combat poverty, financial system, exclusive branding, investments, capacity building, education, marketing, urban development, gender equality, inclusion, welfare, infrastructure, influence, media, crises management, rule of law, law enforcement, prevent/combat crimes are some areas where she has experience at large. Co-Founder and President at Good Government Affairs. Committee Member at UNEDUCH/United Nation. International top-relations. Global Goodwill Ambassador.